If the Santa Cruz pumas had a survivor contest, then 16M would undoubtedly be the winner. 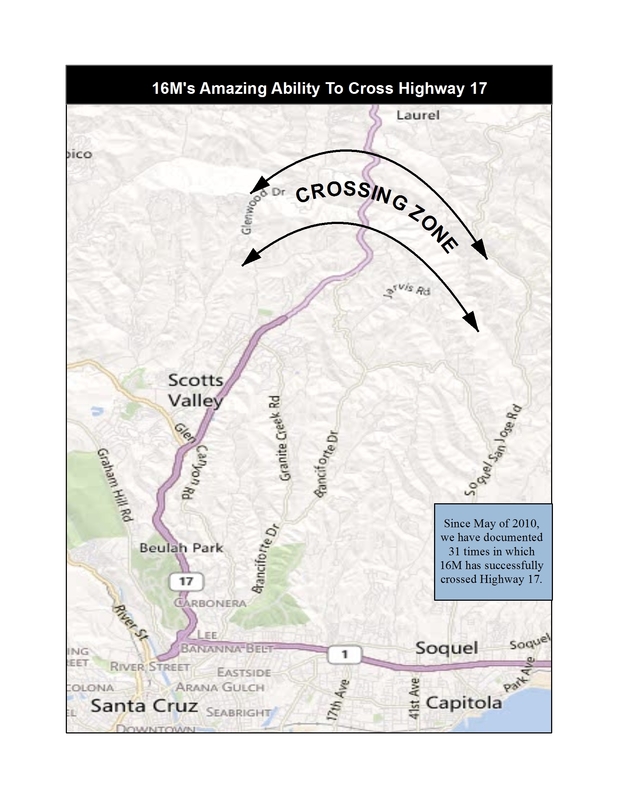 For the past two years, he’s made a dangerous living straddling both sides of Highway 17, a sinuous freeway connecting San Jose and Santa Cruz. All highways, for obvious reasons, are dangerous to wildlife and form barriers between animals living on either side of the road. For some species, these obstacles are insurmountable and can permanently divide a population and end all gene flow. Other species, like pumas, are more mobile and can cross these divides… at least until their luck runs out. One evening in November 2010, 16M miscalculated and got clipped by a vehicle while crossing the freeway. Shortly after that, he lost his first collar, and we only found out about his accident when we caught him on camera one night. 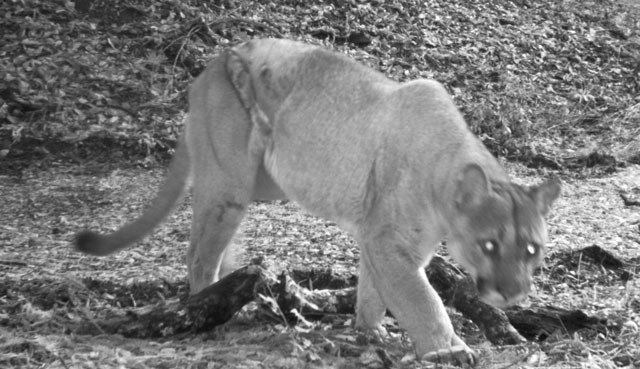 As you can see in the photo below, the incident left him hugely impaired and injured, but he pulled through successfully and healed, proving just how tough mountain lions can be. Today, he has a collar again and he has continued to maintain his huge territory, which means he regularly crosses 17. For now, the odds have been in favor, although the 17 has continued influencing his life. Last year, one of his mates 18F was killed while crossing the freeway (she was pregnant). We are currently using the puma data we collect to look at road crossings, hoping to identify locations along local freeways that might be hotspots for puma-car collisions. Once identified, many tools can be used to mitigate vehicle impacts on wildlife. These include overpasses, culverts, and Florida’s new panther detection system. Of course the best solution is to plan new roads with wildlife in mind so that these structures and monitoring devices are already in place before cars are even allowed on.